OpenEdition Books > Göttingen University Press > Göttingen Studies in Cultural Pro... > Adat and Indigeneity in Indonesia > From Protection to Participation? 2This paper has been divided into three parts. The first part explains the traditional human rights-based approach to indigenous peoples under international law and some of its limitations. The second part elaborates on the “functional approach” to indigenous peoples. It analyses the different ways in which indigenous peoples are expected to contribute to the achievement of certain aims. The third part examines the manner in which the “functional approach” is reflected in the work of international organisations concerning indigenous issues and the legal implications involved. 3From a human rights point of view, indigenous peoples are represented as a historically disenfranchised and vulnerable group, which is in need of special protection (Cabrera 2012:266). This portrayal was incorporated into the first international convention concerning indigenous peoples, namely ILO Convention No. 107. This document situates indigenous peoples in a “less advanced stage” of development and promotes their integration into non-indigenous society (Preamble, Para.2; Art. 1, Para. 1 (a), Art. 2, Para. 1). 2 This perspective was criticised by some indigenous peoples’ advocates to be “assimilationist” as it threatens the preservation of the indigenous identity (Barsh 1987:756; Anaya 2004a: 55). This emphasis on indigenous peoples’ integration and development was abandoned in the late-1980s. Instead, respect for indigenous peoples’ own way of living became the central focus of the second international convention on indigenous peoples’ rights (ILO Convention No. 169, Preamble, Para. 4 and Art. 5 (b)) and other non-binding human rights instruments addressing indigenous peoples’ rights (e. g. Human Rights Committee, General Comment No. 23 1994; Committee on the Elimination of Racial Discrimination, General Recommendation No. 23 1997). The need to repair the vulnerable situation of indigenous peoples still remains in the current human rights discourse, but the means of achieving this aim shall be respectful of indigenous peoples’ cultural integrity. This implies an understanding of the human right to culture as a right with a collective dimension. Indigenous communities, peoples and nations are those which, having a historical continuity with pre-invasion societies that developed on territories, consider themselves distinct from other sectors of the societies now prevailing on those territories, or parts of them. They form at the present non-dominant sectors of the society and are determined to preserve, develop and transmit to future generations their ancestral territories, and their ethnic identity, as the basis of their continued existence as peoples, in accordance with their own cultural patterns, social institutions and legal systems. 5Some of the criteria laid down in this definition have human rights implications. The criterion of historical precedence, for example, advocates the acknowledgment of indigenous peoples as first nations entitled with self-determination (Engle 2010:96). The non-dominant situation of indigenous peoples speaks for an obligation of the international community to protect indigenous peoples against racial or legal discrimination (Committee on the Elimination of Racial Discrimination, General Recommendation No. 23, Para. 4 (b)). The criterion of cultural distinctiveness is associated with the obligation to respect indigenous peoples’ traditional lifestyles (Human Rights Committee, General Comment No. 23, Para. 7). 6The human rights-based approach to indigenous peoples has some limitations. One of these limitations lies in the use of historical arguments to justify the recognition of indigenous peoples’ right to self-determination.3 Originally, the term “indigenous” was shaped within the context of colonialism in America and Australasia. It was used to define those who inhabited the country before colonialism (de Vitoria 1917:116). Today, there is an increasing number of ethnic groups from Asia, Africa and even from Europe who do not fit within this classical understanding of “indigenous”, but seem to face similar cultural or racial discrimination within their countries.4 Accordingly, the scope of application of this seemingly human rights-based definition of indigenous peoples is temporally and geographically limited. 7A second limitation of the human rights-based approach is its foundation on an absolute understanding of indigenous peoples as a non-dominant sector of the society. There are, however, several situations in which indigenous peoples, in fact, represent the majority of the population and have greater access to power than other nonindigenous groups (see the chapter by Hauser-Schäublin).5 Within the indigenous sector itself, politically powerful indigenous organisations appear to be privileged over minority indigenous associations (see the chapter by Müller).6 For this reason, it is essential to critique the label “indigenous” and, thus, its connotation of “repression”. 8Despite its aforementioned limitations, the human rights-based approach to indigenous peoples is reflected in some provisions of the UN Declaration on the Rights of Indigenous Peoples. The preamble of the Declaration recalls the “historical injustices”, “colonization” and the on-going situation of dispossession suffered by indigenous peoples (Paras. 5, 6 and 9). 9While indigenous peoples are subjects of special protection in the human rights discourse, in other fields of international law (international environmental law, international law of culture, law of development cooperation, etc.) indigenous peoples play a more active role. This approach, which is understood as a “functional approach”, centres upon the potential contribution of indigenous peoples to the attainment of certain international goals. These include, among others, environmental protection, food security, human health, economic development cooperation, and promotion of cultural diversity. The following paragraphs provide an examination of these different contributions of indigenous peoples through a “functional” perspective. repositories of vast accumulation of traditional knowledge and experience that links humanity with its ancient origin. Their disappearance is a loss for their larger society, which could learn a great deal from their traditional skills in sustainably managing very complex ecological systems. ethnic and peasant communities living in tropical rain-forest areas of the world are finally being recognized as owners of their territories (…), but only to the extent they accept to treat it – and themselves – as reservoirs of capital. 12In fact, in many instances, it is indigenous peoples themselves who use this environmental discourse as a means to bolster their classical claims for self-determination, participation and autonomy (Morgan 2004:481-491). The UN Permanent Forum on Indigenous Issues7 now supports the engagement of indigenous peoples in the achievement of environmental objectives of the United Nations (UN Permanent Forum on Indigenous Issues 2008, Para. 4). Furthermore, it has called upon the United Nations (UN) to create mechanisms for indigenous peoples’ participation in relevant negotiations concerning climate change (UN Permanent Forum on Indigenous Issues 2008, Para. 30). 8 Further elaboration on the concept of traditional knowledge can be found in WIPO (2002). 13The second contribution of indigenous peoples lies in the use of their traditional knowledge. From a legal perspective, traditional knowledge encompasses all individual or collective innovations and practices for the conservation of biodiversity, traditional medicine and expressions of folklore, among others, developed by indigenous peoples and carrying a socio-economic value.8 It has been internationally recognised that the traditional knowledge of indigenous peoples is of enormous significance in the conservation, use and evolution of biodiversity, as well as in the management of climate change (Convention on Biological Diversity, Preamble, Para. 12; The Nagoya Protocol, Preamble, Para. 20; Andean Community of Nations, Decision 391, Preamble, Para. 5; Ottawa Declaration, Preamble, Para. 6) (see Groth 2007). The Arctic Council,9 for instance, has underscored the importance of the use of Arctic indigenous peoples’ traditional knowledge in the planning and implementation of climate change adaptation measures (Nuuk Declaration 2011:6). 14The use of traditional knowledge is also considered as fundamental in meeting the demands of food security and human health. The International Treaty on Plant Genetic Resources for Food and Agriculture underlines the major role of indigenous farmer communities in assuring food and agriculture production through their use of traditional practices (Art. 9, Para. 1). Similarly, the World Health Organisation stresses the importance of facilitating access to traditional medicines of indigenous and local communities on behalf of the global population (2002). This explains the scientific community’s push towards the creation of an international legal regime for access to genetic resources and traditional knowledge involving indigenous communities (Chege Kamau et al. 2010:246, 254). 15In light of this, indigenous peoples’ traditional knowledge has become a crosscutting issue. This has motivated the international community, in general, and international organisations, in particular, to invest time and resources towards the establishment of partnerships with indigenous communities, both at the local and international level (see Sanmukri in this volume).10 In fact, as will later be explained, traditional knowledge has been, in many cases, the springboard used by indigenous peoples to gain access to international forums (UN Permanent Forum on Indigenous Issues 2008, Para. 30). 16Another functionality of indigenous peoples is the promotion of cultural diversity. The international community affirmed in the Convention on the Protection and Promotion of the Diversity of Cultural Expressions that “the protection and promotion of the diversity of cultural expressions presuppose the recognition of equal dignity of and respect of all cultures, including the culture of persons belonging to minorities and indigenous peoples” (Art. 2, Para. 3). This has also been reflected in the UN Declaration on the Rights of Indigenous Peoples (Preamble, Para. 3), the Vienna Declaration and Programme of Action (Preamble, Para. 13; see also General Assembly Resolution 1993, Para. 6), the UNESCO Declaration on Cultural Diversity (Art. 4), among many others. 17Indigenous peoples have been very often portrayed as groups existing outside modernity (Allen 2006:315, 318). They have been depicted either as “pre-modern societies” in need of civilisation (Rajapogal 2003:29) (as was in the case in ILO Convention No. 107) or as the “victims of progress” (Tenant 1994:1, 17) (as occurred in ILO Convention No. 169). Whether from one perspective or the other, recognition of “indigenous peoples” as subjects of special rights appears to depend on the maintenance of a particular distinct culture or orientation towards the world and nature (Borrows 2009:408). Such an understanding would play against those indigenous individuals or communities which have progressively started to integrate into mainstream society. On the other hand, representation of indigenous peoples as “backward societies” could also lead one to the problematic conclusion that certain indigenous groups or individuals might still be regarded as “incapable” of representing themselves before states and the international community, but could do so only through NGOs.11 At this point, one should take into consideration that even longstanding indigenous groups are undergoing a voluntary or probably inevitable process of integration with the so-called “modern world”.12 This raises the question, what will the future of this culturally-based construction of “indigenous peoples” be? make the development process more inclusive of indigenous peoples by incorporating their perspectives in the design of development programmes and poverty reduction strategies, and providing them with opportunities to benefit more fully from development programs. 22Indigenous peoples have been granted special participatory rights particularly in international environmental forums. The Agenda 2117 requires states to include indigenous peoples in the decision-making, planning and implementation of sustainable development strategies (Section III, Para. 26). Based on this, indigenous peoples are, today, one of the nine major groups participating in negotiations within the UN Sustainable Development Division (UN Sustainable Development Platform Knowledge). In a similar manner, the Arctic Council has conferred the status of permanent participants upon indigenous arctic organisations (Declaration on the Establishment of the Arctic Council, Para. 2). 23Indigenous peoples are also taking part in international negotiations concerning traditional knowledge. Indigenous delegates participate in the meetings of the “Intergovernmental Committee on Intellectual Property and Genetic Resources, Traditional Knowledge and Folklore” in the World Intellectual Property Organisation (Secretariat of WIPO 2011). In addition, the Conference of the Parties to the Convention on Biological Diversity has involved indigenous organisations in negotiations related to traditional knowledge (COP Decision VII/16, section G, Para. 10). 24The remainder of this section identifies some complexities and challenges ahead in the recognition of indigenous peoples’ legal status and participation in the international realm. 25Since the idea of partnership between international organisations and indigenous peoples sounds compelling, more and more indigenous organisations are coming into existence in order to catch the attention of international organisations. For many years, the international indigenous peoples’ movement comprised basically organisations from North-America, Latin-America and Australasia which resorted to the “first-people argument” to assert their claims for self-determination (Engle 2010:46-66). However, as early as when the United Nations decided to include indigenous organisations in the drafting process of the Declaration on the Rights of Indigenous Peoples (ECOSOC Res. 1982/34), emerging Asian and African indigenous groups began to appear on the international scene. To justify their “indigeneity”, these organisations have resorted to both human rights and functional arguments (Erueti 2011:93, 115). This is, for example, the case of the Indonesian indigenous alliance Aliansi Masyarakat Adat Nusantara (AMAN), which highlights the “capacity of Indigenous Peoples to maintain and expand their traditional wisdom in protecting the earth, water, and all natural wealth contained within nature” (see the chapters by Arizona/Cahyadi, Müller, Steinebach, Grumblies, Klenke, and Hauser-Schäublin in this volume).18 Since there is no universal definition of indigenous peoples under international law, one could argue that none of these groups should be denied the right to label themselves as “indigenous”. Thus, today, new indigenous organisations have emerged, such as the Asia Indigenous Peoples’ Pact, comprising indigenous groups from India, Pakistan, Bangladesh, Thailand, and Indonesia, among others (AIPP 2012). Yet, at the national level, some of these self-identified indigenous communities from Asia and Africa are regarded by their national governments merely as minorities or tribal populations (Cabrera 2012:276). 26Some other culturally distinct groups such as Afro-descendant communities – not considered as “indigenous” in the classical sense − are searching for recognition of their own collective rights (Cabrera 2012:280). In doing so, they have already initiated a campaign for the recognition of their own identity and own collective rights as independent from the indigenous identity (Marchesi 2011). Others have rather preferred to construct their own indigenous identity (Cabrera 2012:280). This second option has prevailed in some Latin-American countries where indigenous peoples have achieved political recognition and have been assured access to governmental structures (Cabrera 2012:278-281). 27It is important to reflect more on the ways and means through which indigenous organisations are meant to exercise participation in international forums. Some indigenous organisations contend that their participation in international negotiations is ineffective and limited (Joint Statement of the Grand Council of the Crees (Eeyou Istchee) et al. 2011, Para. 7; Grand Council of the Crees (Eeyou Istchee) 2011, Para. 74). Moreover, they claim that participation of indigenous peoples in global governmental structures should be full and effective based on their recognition as self-determined groups under international law in accordance with the UN Declaration on the Rights of Indigenous Peoples (Joint Statement of the Grand Council of the Crees (Eeyou Istchee) et al. 2011, Para. 9). 28In fact, in many cases, indigenous groups which are afforded the opportunity to participate in international law and decision-making processes only hold “observer status” (Conference of the Parties to the CBD, Decision IV/9, Para. 2; Secretariat of WIPO 2011:2). Moreover, indigenous organisations are often assimilated into nongovernmental organisations (NGOs) (Human Rights Council 2012, Para. 10-12). However, this paper submits that more participation necessarily depends on the answer to the following long-standing controversial question: Who has the right to represent the interests of indigenous peoples at the international level? Due to the complexity of this issue, possible answers to this question have to be left for further research. 29International Law has looked at indigenous peoples through two different lenses: a “human rights-based approach” and a “functional approach”. The first approach emphasises “protection”, whereas the other centres upon “participation”. A human rights-based approach falls short of capturing the current dynamics of some indigenous groups. On the contrary, from a purely “functional perspective”, it would not make any difference whether a group is indigenous in its classical sense or not. What matters in this case is how a particular community can contribute to the achievement of environmental protection, sustainable land-use and cultural diversity, among others. 30It has been demonstrated throughout this paper that the functional approach is intrinsically entwined with the recognition of indigenous peoples’ participatory rights in international law and policy-making. This has been specially boosted by international organisations. In this context, participation of indigenous peoples in international negotiations emerges as a practical necessity, rather than as a legal duty. 31The number of policies and mechanisms enhancing participation of indigenous peoples at the international level has increased significantly within the last two decades. This seems to be parallel to the emergence of new indigenous peoples in the international arena seeking international legal recognition. Nevertheless, the participation recognised to indigenous peoples in international forums seems to be limited. 32This paper argued that the use of a functional approach has benefited indigenous peoples in the sense that they have started to be regarded as actors of international governance, rather than mere recipients of norms and policies affecting them. At the same time, the paper recognised the danger of absolutism in the use of a functional approach. There is a possibility, within this approach, of ignoring the indigenous groups which do not subscribe to the roles that international law has defined for them. 1 In May 2012, the UN Deputy Secretary General opened the 11th session of the Permanent Forum on Indigenous Issues inspiring indigenous delegates converged at the meeting to move towards the day when indigenous peoples are heard, listened to and empowered (UN News Service 2012). Similar wording was used some years ago by the Executive Director of the International Fund on Agricultural Development, who pointed out that that the empowerment of indigenous peoples mattered deeply to the organisation she represented (IFAD 2008). 3 This has been the position of North American indigenous groups to claim both internal and external forms of self-determination (Engle 2010:77). 4 Critical perspectives on the use of historical arguments as the justification for indigenous peoples’ rights can be found in Aukerman (2000:1011); see also Cabrera (2012:273-278). Self-identified African indigenous communities have argued that they have felt “invisible” to the United Nations (Permanent Forum on Indigenous Issues 2006). 5 This is, for example, the case of some indigenous peoples in Fiji (Minority Rights Groups International 2012:169). 6 A political and sociological analysis on the division within the indigenous sector in Bolivia, as well as on the differential treatment given by the government of Evo Morales (who is well-known as the first indigenous president in Bolivia) to different indigenous organisations can be found in Schilling-Vacaflor (2010). 7 The UN Permanent Forum on Indigenous Issues was created in 2000 by the UN Economic and Social Council as one of its advisory bodies on indigenous issues. It is composed of indigenous representatives of different regions of the world. For more information on the role and competences of the UN Permanent Forum on Indigenous Issues, see ECOSOC Res. 2000/22. 9 The Arctic Council is an intergovernmental forum composed of eight countries located in the northern hemisphere. It has the aim of protecting the Arctic environment (Ottawa Declaration, Preamble, Paras. 1 and 4). 10 Evidence of this is the framing of the so-called “UN-REDD” (UN Collaborative Initiative on Reducing Emissions from Deforestation and Forest Degradation), which attempts to create collaborative partnerships between states and indigenous communities to reduce CO 2 emissions. More information on this programme can be found in: UN REDD Programme Strategy (2011-2015). 11 One of Survival International’s general aims is to “support legal work to ensure that tribes are expertly represented” (http://www.survivalinternational.org/info). 12 An example of the integration of certain indigenous groups with the “modern world” is the case of the Native American groups in Nevada (Ahmad 2006). 13 For further analysis on the functional approach to indigenous peoples in the context of international development cooperation, see Cabrera (2012:281-289). 14 The apparently human rights-based approach of the World Bank policy on indigenous peoples is obscured by the long-standing refusal of the Bank to recognise the right of indigenous peoples to free, prior and informed consent in relation to the implementation of economic development projects (Mackay 2010:316). 15 The Permanent Forum aims to enhance cooperation among states, the UN and indigenous organisations in issues of mutual interest (ECOSOC Res. 2000/22). 16 One of these mechanisms is the UN Voluntary Fund for Indigenous Peoples (GA Res. 40/131, December 13, 1985). 17 Agenda 21 is a voluntarily implemented action plan with regard to sustainable development which resulted from the UN Conference on Environment and Development of 1992. 18 See statement of the Aliansi Masyarakat Adat Nusantara (AMAN) on the official website of the Asia Indigenous Peoples’ Pact (AIPP),http://ccmin.aippnet.org/index.php?option=com_content&view=article&id=5&Itemid=8. However, the creation of new targeted categories for the identification of certain vulnerable groups in the international realm has been regarded by some as unsustainable (Kymlicka 2007:8). CABRERA ORMAZA, Maria Victoria. From Protection to Participation? Shifting Perceptions towards Indigenous Peoples under International Law In : Adat and Indigeneity in Indonesia : Culture and Entitlements between Heteronomy and Self-Ascription [en ligne]. Göttingen : Göttingen University Press, 2013 (généré le 19 avril 2019). Disponible sur Internet : <http://books.openedition.org/gup/165>. ISBN : 9782821875487. Cabrera Ormaza, Maria Victoria. “From Protection to Participation? Shifting Perceptions towards Indigenous Peoples under International Law”. Hauser-Schäublin, Brigitta. Adat and Indigeneity in Indonesia : Culture and Entitlements between Heteronomy and Self-Ascription. Göttingen : Göttingen University Press, 2013. (pp. 31-41) Web. <http://books.openedition.org/gup/165>. HAUSER-SCHÄUBLIN, Brigitta (dir.). 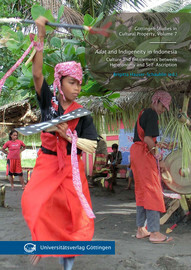 Adat and Indigeneity in Indonesia : Culture and Entitlements between Heteronomy and Self-Ascription. Nouvelle édition [en ligne]. Göttingen : Göttingen University Press, 2013 (généré le 19 avril 2019). Disponible sur Internet : <http://books.openedition.org/gup/150>. ISBN : 9782821875487. Hauser-Schäublin, Brigitta, ed. Adat and Indigeneity in Indonesia : Culture and Entitlements between Heteronomy and Self-Ascription. Göttingen : Göttingen University Press, 2013. Web. <http://books.openedition.org/gup/150>.